Food Kids will eat: Watch me pull a Chicken Sandwich out of a hat Recipe? Looking for food your kids will eat? Jake graduates from chicken nuggets to chicken sandwiches in this easy chicken recipe. The secret: Hot Dog Buns. Chicken nugget chicken sandwiches for kids with hot dog buns. A big, Tyson, chicken patty is too big. I saw frozen, mini-sandwiches at Target @ 6 for $2.99, not a bad price, I guess. I am so frugal. It seems like a waste. My $3 could be better spent elsewhere. Have you tried Chick-Fil-A's mini-breakfast sandwiches? These are so awesome :-) Election day, they were handing them out at my polling place, "Yum!" Strictly by accident, I stumbled across this idea. Jake begged me to make a chicken sandwich for him. We had nuggets, but he refused to eat them! He wants a chicken sandwich with pickles and ketchup only. Somebody sent me a message because a light bulb turned on in my head. I took his plate, laid out a hot dog bun, and cut the halves apart. Then I took 3 chicken nuggets and spaced them out evenly on the bottom half of the hot dog bun, added a pickle on each nugget, then a squirt of ketchup. 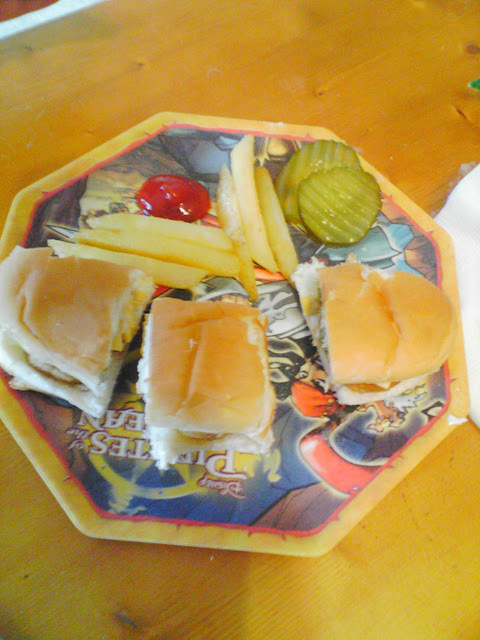 Next, I put the top on the sandwich and cut it neatly into 3 sections- or "mini-chicken sandwiches". "Jake its chicken nuggets or nothing. We only have hot dog buns, no hot dogs, and nuggets!" "Waiter, I want a chicken sandwich with no mayo, just pickles, no cheese, and ketchup!" "Arrgh! 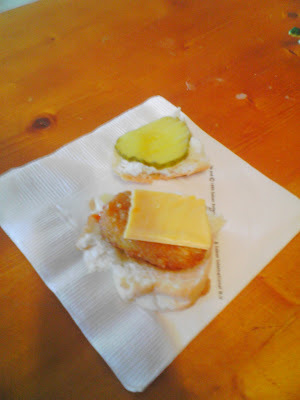 We don't..."
Mini Chicken Sandwich from Chicken Nuggets. The Monster Health Book: Feeling Great for Monsters and Kids!